When looking to redesign your office you may want to consider including plants in your design plans. This is something that Office fit out companies like Mobius at Work can help you with. They will take into consideration the space you have available, the business sector that you work in and the needs of the business to come up with an incredible design for you. It is thought that plants can help to increase productivity in an office environment with some studies thinking this could be by as much as 15 percent. 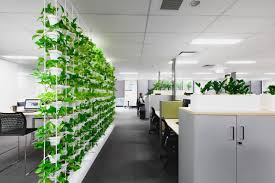 This is thought to be in part to the fact that the plants help to clean the air within the office and also due to the natural calm feelings that are produced when you are around nature. A study undertaken in Sydney in 2010 also found that the levels of stress within employees also dramatically reduces if they have sight of a plant from their desk. The results reported include a 37 percent reduction in anxiety and tension; 58 percent reduction in depression; 38 percent reduction in fatigue and a 44 percent reduction in anger and hostility. When looking at the psychology of colour it shows some evidence as to why this might be as the colour green is associated with relaxation and calmness and combine this with the feelings that are associated with being near items for nature and you have the recipe for a working environment that is great for everyone’s wellbeing. When staff feel less stress and achieve more during their working day morale naturally increase and in contrast sick days decrease. This is partly due to the fact that a high percentage of sickness days are attributed to stress and anxiety. 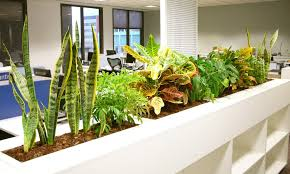 Further studies into the positive effects of plants in an office environment also noted that it makes them more appealing to prospective employees and interviews should always be conducted in a room that has at least one plant present. Plants can help to give off the illusion of more natural light available than there actually is. Plants can also reduce the noise pollution that occurs in offices and certain plants like bamboo are often used as dividers and barriers to reduce the noise in particular areas of an office such as a staff relaxation area or meeting space.